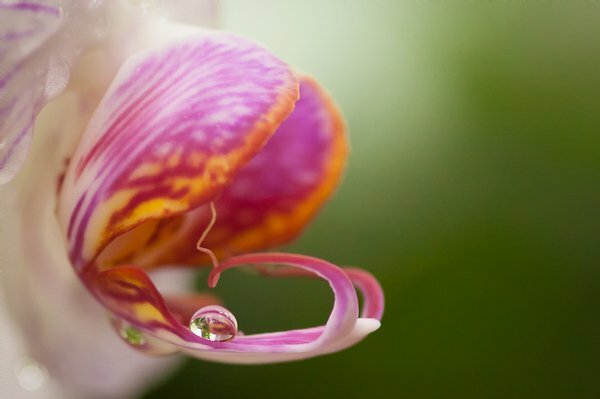 The orchid exhibit was spectacular and I only saw this tiny drop sitting inside the orchid because I was really looking at everything closely. It was a flower about shoulder height just inside the door to traditional orchid room in the south-east corner of the building. If you walked through the door and didn't immediately look left, you'd miss it. Low light, next to a door, people walking behind me constantly....not the best place to try and take a shot like this and not a place I could have tried to sneak a quick tripod shot. It just would have blocked everything up and pissed people off. This is why we practice steady shooting and bracing. Bump the ISO, wrap the strap around my shoulder, hands in tight, drop exposure a stop, and hope for the best.